(c. 14⅝-14¾ × 11⅜-11¾ in [37-37.5 × 29-30 cm]). Thienemann + Schwarz (Catalogue of a Ridinger-collection, colour plate vol. I, X) 162-185; Weigel XXVIII, 15, A (of C); Schwerdt III, 137; Thiébaud 783; Ridinger Catalogue Darmstadt, 1999, III.20-III.30 with 11 ills. ; Cat. Helbing XXXIV (Ridinger) no. 325 as “One of the most important collections of the artist” (1900). Early impressions on large strong laid paper of 19⅛ × 13½ in (48.5 × 34.3 cm) – divided in wide margins above + below and smaller at the sides – as almost perfect. Then pronounced larger copies of 19¾-20⅛ × 14⅛-16¾ in (50-51 × 36-42.5 cm) as the ones in the Schwerdt Collection and former here were to qualify as an intermediate state somewhat later in respect of their plates 21-23 as printed from two plates. 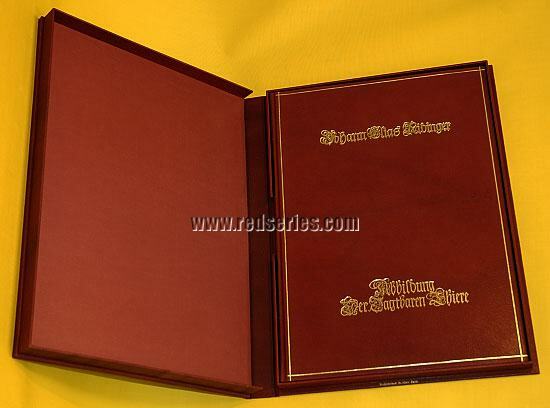 – Title and plates a little time-marked throughout, but as a whole a very fine copy already before its binding, Solander box and – printing plate in its optically excellently condition. above right and the further marks as there are the title in red and black, the plates 21-23 printed from undivided printing plate by analogy to the plates 1-20 and other finer characteristics more. In the 2nd edition (Weigel B, Helbing 328) the title is printed uniformly in black as Th. page 294, too. Between them that state with the title in red + black, but the plates 21-23 printed from two printing plates while omitting a separating line each (copies Schwarz/von Gutmann + Schwerdt). Chronologically for the present not to be dated the title page of Ridinger’s personal copy with its higher type area (37.8 cm), the uniformly shorter comma strokes, and a differing ornament close of the red double-line. The line spacings besides evenly more balanced what is due not only to the higher type area, rather especially to a more exact fit in of the second printing passage, too. So far also the copy here allows a limited interesting view over the shoulder of the printer into the sequence of operations. All inscribed in the plate with several variants of J(ohann) E(lias) Ridinger inv(enit) del(ineavit) sc(ulpsit) et exc(udit) A(ugusta) V(indelicorum), plts. 21-23 without invenit. For the complete set of the preparatory drawings at Munich see their splendid facsimile-edition. excepting the reduced ones of lion + tiger (recte “maybe a jaguar”, Th.) as “not to be found in our forests”. Apart from that there are shown bear – stag – hind – boar – fellow-deer – wolf – roebuck – lynx – ibex – chamois – hare – fox – beaver – otter – badger – wildcat – marten + weasel – polecat + squirrel . par excellence. Doubtless the most important illustrated one relevant to the subject. And coming up to modern standards thematically and artistically undispended already in general till to date. shall be mentioned expressly. Just as documented by inscription. 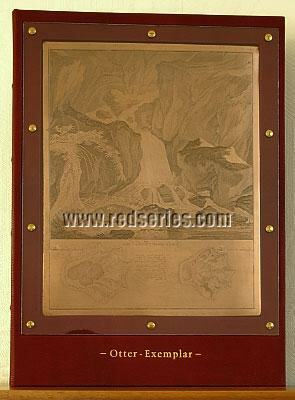 Shielded from tarnishing by fine application of varnish, the plate is generally printable in the ordinary course of its use through the times, however, it is offered and sold as a work of art and a collector’s item, thus without prejudice to its eventual printing quality. For already his painting “Playing Weasels” from 1911, preceded 1909/10 by the lithograph of the same name, betrays the knowledge of several Ridinger coppers from entirely different sets. Marc shows two weasels, of which the one in the tree, bowed over a bough, looks down upon the one sitting in raised attitude on the ground. The trees besides of an eccentricity which he uses in this ostensible density in the painted œuvre only in the two “Acts below Trees”, H.-J. 143, of the same year. For the thematic initial spark Ridinger’s small-sized sheet “The Weasels”, Th. 479, from 1740 as sheet 89 of the set Design of Several Animals stands. Here, too, two of them playing, yet both on the ground and in an utterly different context. The latter Marc split up. And took the attitude of the two animals from sheet 86 of the set, the two pine martens Th. 476 (additionally available here the companion piece with the two beech martens Th. 475 plus the original printing plates to both). The young one of which hangs across a bough of equally low height as with Marc and looks down at the mother standing on the hind paws against the trunk luring with a captured bird. “Playing Squirrels” as sheet 88 (Th. 478) shows the same situation, only with the difference of a further one in the tree, too, but keeping a little aloof and not involved in the play. Yet the bizarre tree – and as such Sälzle characterizes it expressly in the 1980 facsimile edition of the preparatory drawings for the suite here – as rather rare also for Ridinger he took from “Trace of a Marten / Trace of the Weasel” (Th. 181, separately available here, too) with the same attitude of the marten in the tree and the, however, neutrally shown weasel on the ground. by an artistic bridging from 18th to the 20th centuries .